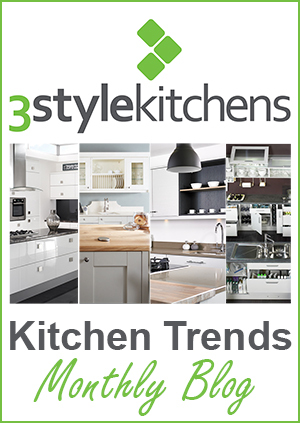 Welcome to the first Kitchen Trends Monthly Blog. As it’s the 1st of January as well as the first Kitchen Trends Blog, we’re kicking off with a look at some of the kitchen design trends that we’re likely to see this year. Some have been growing in popularity during the latter part of 2015 and some are new trends that will start to emerge this year. Maybe we’ll look back in December and see how many of them made an impact in 2016?! For many years, counter tops have been fairly chunky affairs whether in timber, laminate, granite or stone. Particularly in more traditional, country style kitchens. Now that material quality and manufacturing techniques are moving on, it’s becoming increasingly popular to use very thin worktops. 28mm or even 38mm thick counter tops have been standard for quite a while but new worktops that can be as thin as just 8mm are tipped to be very popular this year. These skinny counter tops create a minimalist, sleek, understated look and while they have been more commonly seen in modern kitchen, they are now starting to appear in traditional kitchen designs. Painted and coloured kitchens have been big in 2015 and the love for colour will continue but possibly in a slightly different form. Tipped to be big in 2016 are neutral colour kitchens with statement colour accents in splashbacks, cooker hoods and even appliances. This allows you to be creative with colour but also gives you the flexibility to change the look reasonably easily at a later date if desired. Cabinet doors have moved on over the years and with folding, hinged doors, roller doors and sliding doors come different options for cabinet format. Horizontal cabinets are growing in popularity. Usually used for wall cabinets, they offer contrast to more traditional style doors on floor cabinets or mirror the sleek lines of long horizontal drawers. The use of textured finishes is becoming popular as a way of adding interest without necessarily adding colour. While textured tiles have been seen before, textured door finishes will be starting appear in kitchen designs in 2016. It may sound like a music genre but alternative metal finishes will be seen in kitchens this year. Chrome and steel have always been popular but other finishes and metals will come to the fore including brushed and textured steel, copper, pewter and brass. Expect to see them on worktops, cooker hoods, appliances and door furniture. These are just 5 trends that we think will be hot for 2016 so remember you heard it here first! This is the first blog of a new Kitchen Trend series that we will be posting monthly from now on so please come back again in February for the next instalment or like our Facebook page for regular updates. 1 Response to "Kitchen Trends Monthly Blog – January"
The trend of alternative metals gives a distinct look to your kitchen. It sure is here to stay. Also, thin granite or granite kitchen worktops are in vogue as compared to the traditional chunky ones, giving your kitchen a chic look. Indeed, an informative post.